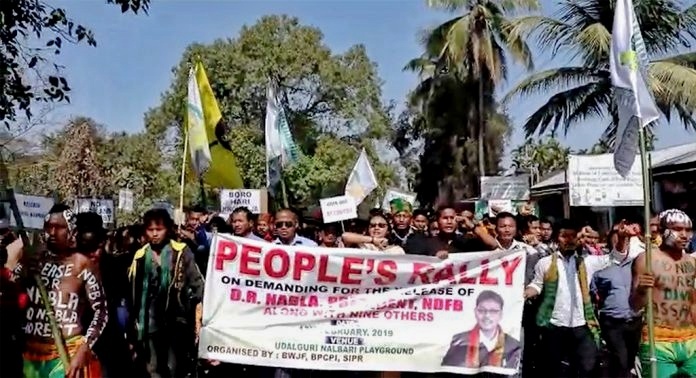 The protest rally was organized under the aegis of Bodo Women Justice Forum, Bodo People’s Committee for Peace Initiative (BPCPI) and Society for Indigenous People’s Rights (SIPR). NDFB chief Ranjan Daimary was found guilty in the October 30, 2008 serial bomb blasts in the State and was convicted to life imprisonment by the CBI special court. Protestors rented the air with slogans ‘No Ranjan, No Vote’, ‘No Ranjan, No Rest’. Speaking to media persons on the sidelines of the protest, Bodo Women Justice Forum (BWJF) chairperson Anjali Daimari accused the saffron party of ‘discrimination’ with the insurgent outfit. Anjali alleged that the leaders of the United Liberation Front of Assam – Independent (ULFA-I) received ‘grand welcome’ upon landing in the country while on the other hand, Ranjan was brought to India from Bangladesh ‘tied with an iron chain’.